^ "Sensus Penduduk 2010 - Penduduk Menurut Wilayah dan Agama yang Dianut" [2010 Population Census - Population by Region and Religious Affiliations] (in Indonesian). Badan Pusat Statistik. Retrieved 27 May 2014. ^ a b c d e f g h Michel Picard (2004). Martin Ramstedt (ed.). Hinduism in Modern Indonesia. Routledge. pp. 9–10, 55–57. ISBN 978-0-7007-1533-6. ^ a b McDaniel, June (1 August 2010). "Agama Hindu Dharma Indonesia as a New Religious Movement: Hinduism Recreated in the Image of Islam". Nova Religio. 14 (1): 93–111. doi:10.1525/nr.2010.14.1.93. 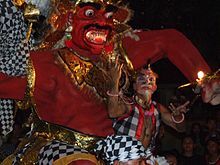 ^ a b Ngurah Nala (2004). Martin Ramstedt (ed.). 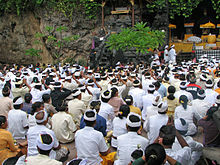 Hinduism in Modern Indonesia. Routledge. pp. 77–79. ISBN 978-0-7007-1533-6. This page was last edited on 3 April 2019, at 10:01 (UTC).